Meglena Kuneva is a former Minister of EU Affairs in the government of Simeon Saxe-Coburg and the NSMP party (2001-2005), the three-way coalition government (2005-2007), Bulgaria's Chief Negotiator in the EU accession talks in 2001-2007, and Bulgaria's first EU Commissioner in 2007-2009, when she was in charge of consumer protection. 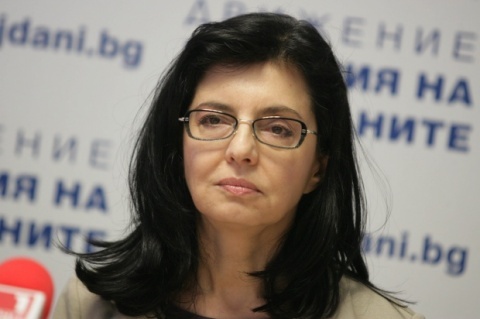 Kuneva ran as independent candidate for President of the Republic of Bulgaria in the 2011 presidential elections. How would you describe the pre-election campaign so far? What are your impressions from your travels across the country? My trips and the people I meet give me the strength and motivation to keep on walking. What strikes me most is that Bulgarians really want to see Bulgaria changed. We talk about economic woes, the high unemployment rate and poverty and how to cope with these problems. Small wonder I was very disappointed to see most of our political rivals going way off, off the topics, which have direct impact on ordinary people’s lives. Unfortunately, I do think that the elections will be marred by grave electoral offenses. We have quite many indications for that – remember the wiretapping scandal, remember the politicians and journalists spied on, remember the MPs carrying in their hands bags of ballots, remember the raids upon the offices of our party. All this clearly shows that this time, once again, efforts will be deliberately made to rig the elections. But as I already said the meetings with ordinary people inspire me to keep on my fight for turning Bulgarian into a normal country. One of the first things, which I will do after the election, is make sure that the next elections are transparent and not manipulated. Bulgaria needs to hold normal European elections, where parties vie for the votes of the people and the people are free to express their views. My personal impressions are that the scandal undermined GERB approval rating among people from vital groups of Bulgaria’s society – the normal, intelligent people, who know that these practices are totally unacceptable for a European country. Those who are doing business could not remain indifferent too. The wiretapping scandal got them wondering how wide-spread these wiretapping practices could be. Could a small company, employing 5 or 10 employees, be wiretapped so that authorities can check whether it serves or not the ruling party? Last but not least, after the scandal erupted the party of Boyko Borisov started to lose credibility among the international community - our Euro-Atlantic partners and all our friends around the world who expect Bulgaria to be a country of the free initiative and economic development. How do you assess the reaction of President Plevneliev on this issue? I would rather not comment incomplete data and half-hearted statements. Let’s give prosecutors the time to do their job. The only thing, which is clear for the time being, is that there have been grave violations of rules as far as unauthorized wiretapping is concerned and this is certainly something that the interior minister knew. I sincerely hope this time the prosecutors will not be put under pressure and we will finally see that justice is done. What are people more worried about – the spying scandal, the high unemployment rate or the fact that they getting poorer every day? People care about everything that happens in the country. Every day I'm in a different city, in a different village and discuss various topics with the people. More often we talk about the economy, the unemployment and poverty, about the children who leave Bulgaria and will never return, about the state that always interferes where it should not, but is nowhere to be found where it is needed. Sometimes we talk about the wiretapping scandal, about the ways the state creates and protects monopolies. What people want at the end of the day is that Bulgaria turns into a normal country, a country of the rule of law, in which the state helps you rather than interferes. These are my goals too. Taking the liberty to use the word “war”, your party is waging a war against what? Our party is waging a war against the lack of normality in Bulgaria, this is our mission. Eight years ago I signed Bulgaria’s Treaty of Accession to the European Union and, believe me, the country I imagined then is not the country where I live today. I was confident that a few years after our EU entry Bulgaria will become a prosperous, dynamic and developing at full speed European country in which the rules will be equal for all. I believed that Bulgaria’s young people will study at the world’s most prestigious universities only to return to Bulgaria and work for themselves, their families and their country. What happened in those years is not what I dreamed about. This is my war - it is both political and personal. My war is against the lack of normality, against the lack of rule of law, against a handful of people piling profits on the back of others. What are the first three things your party will do if voters give it the thumbs up? Which are the first three steps you will undertake to revive Bulgaria’s economy? This is the most important question - what job politicians will do after the elections. Our program clearly sets out the most important reforms that should be implemented immediately after the election. Firstly, we will wipe out all forms of state racketeering, which harm small and medium-sized businesses. Our estimates show that this step will create 150,000 jobs in less than 2 years. As a result the economy will grow by about 5% a year, while incomes will increase by twice as much - 10%. Secondly, we will start an all-out war against monopolies and enterprises, which enjoy state protection and thus rob people of opportunities for more incomes and steal opportunities for doing business from the small and medium enterprises. Thirdly, it is essential to continue to absorb EU funds at a higher speed – the data I have seen makes me think this process could be accelerated significantly. I will also work for tightening up the control in public procurement tenders. As you can see, the steps are not three, but more. Bulgaria needs people who really want to do the job and who know how to do it. Why do you think that out of all political rivals your party makes the former rulers from GERB feel most uncomfortable? I think the reasons are quite obvious – my team and I are just the opposite of what GERB is. Our mission is to bring normality back to Bulgaria, to banish kick out the proteges, to create a society in which everyone has an equal chance - no matter whether you know the Prime Minister or not. That’s why we make the people from GERB feel uncomfortable. How would you comment the latest polls, which say that Bulgaria's center-right GERB party, which was forced to resign under public pressure in February, keeps its lead over the Socialists less than a month before Bulgarians vote in the crucial general elections? In a healthy society, like the one I have been talking about right now, it is not my duty to comment on pollsters’ credibility. It is their own duty to be precise and objective. I personally treat on a par all of them, regardless whether they say my party will gain 4% or 9%. How do you assess the approval rating of your party? I feel satisfied, I feel I have the strength to keep on going. I am not interested in ratings, I am just doing my best to work for people’s better future. Deep inside I sincerely believe that when you do a good job, voters will support you. This was my style when I was chief negotiator with the European Union, this was my style when I was European Commissioner, that's my style today. Have you ever heard me then to talk about my rating? Of course not. I just did my best to do what I had to do for my country, and then for all Europeans. The citizens showed their gratitude with their support. This will be my approach from now on too. This will work in the future. Under what circumstance will you change your firm decision not to enter coalitions after the elections? You just have to understand one thing – the parties, which we ruled out categorically as coalition partners, killed my dream, the dream of most Bulgaria to live in a normal and prosperous European country, in which the rule of law is respected, all citizens are equal and the state controls monopolies rather than encouraging them. I am teaming up with all Bulgarian citizens who believe in this. Most of these 31 things do not require massive funding - most of them just show how the state can work in a more efficient way. This is my vision for Bulgaria - it must be efficient just all European countries are. But when it comes to financing, I always say that if the government stops protecting monopolies at the expense of small and medium businesses, the economic revival will be immediately felt. Besides Bulgaria currently has available massive resources of funding. This is the recipe for the revival of Bulgaria’s economy - internal efficiency, a crack-down on monopolies and absorption of EU financial flows. Will the fight be over on May 12? Our mission is to make Bulgaria a normal, prosperous and truly European country and the fight for this only begins on May 12. I hope that people will support me, my team and especially my vision about Bulgaria’s future. I have made a pledge to all Bulgarians that we will work to turn our vision into reality. Only after this happens, the fight will be over.